My goal is a 5-STAR experience for both. New in plastic box. Great shoes! 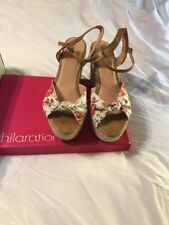 the uppers are a white multi floral print and made of all man made materials. 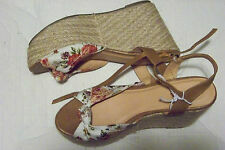 these are a straw super wedge style shoe. the heel of the shoe is 4 1/4" high at the back and the platform is 2" high. 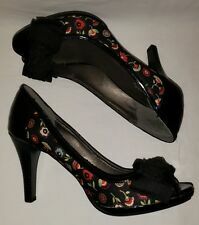 You are buying an Xhilaration Beautiful Floral Bow Peep Toe High Heels Black Size 9M. In very good used condition. Please carefully look at the photos before purchasing. Thanks for looking and happy shopping.Shipped with USPS Priority Mail. 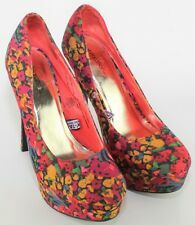 The flower design on wedge makes these stand apart from other wedges and the Cogna color is stunning! You can wear these with a sundress or even shorts if you like! These have a lot of wear left to them.